If you were the first person to someday ride your weanling, would you feel safer if the colt did – or did not – have a proper foundation? You have years till you can ride your colt or filly – and a lot of training needs to be done in the meantime. We begin with simple body control. Teach your foal to stand properly for a bath – but also see this as an opportunity to strengthen your position as leader in your herd of two. Follow this script – and in no time you’ll be able to tie the horse that doesn’t tie. Biting is the worst vice a horse (of any age) can have. Here’s what to do about it. Teaching your horse to lift its feet on cue is really very simple. Here’s how. Rather than chasing your horse around the pasture, wouldn’t it be a lot easier to whistle and let it come to you? Click here to hear "Horses That Bite," an entire chapter from the book "Your Foal: Essential Training." ​You have years till you can ride your colt or filly - but there's a lot of training that needs to be done in the meantime. They need to cooperate for the farrier, to stand near you politely, to be lead around the barn, to respect your space - they need to become a cheerful member of your family. This is your step-by-step guide; it shows you exactly what to do, what to look for and in what order. Do you have a foal on the way? Maybe you've got a weanling who's growing like a weed but in need of training and possibly getting dangerous? Do you know what training is essential for baby horses, how to approach the work - and how much is too much? You have years till you can ride your colt or filly - but there's a lot of training that needs to be done in the meantime. They need to cooperate for the farrier, to stand near you politely, to be lead around the barn, to respect your space - they need to become a cheerful member of your family. This is your step-by-step guide; it shows you exactly what to do, what to look for and in what order. If you were the first person to someday ride your weanling, would you feel safer if the colt did - or did not - have a proper foundation? 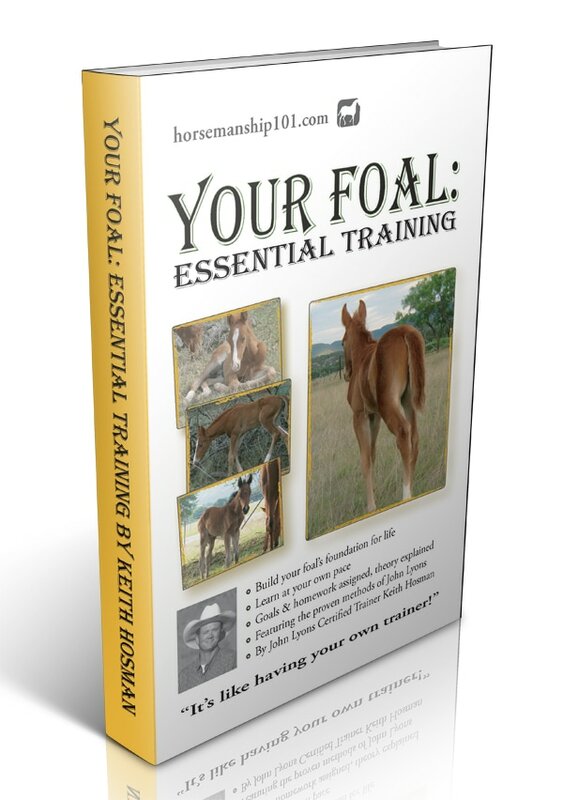 Your Foal: Essential Training for the Weanling Horse is broken down into five "Days" or sessions. 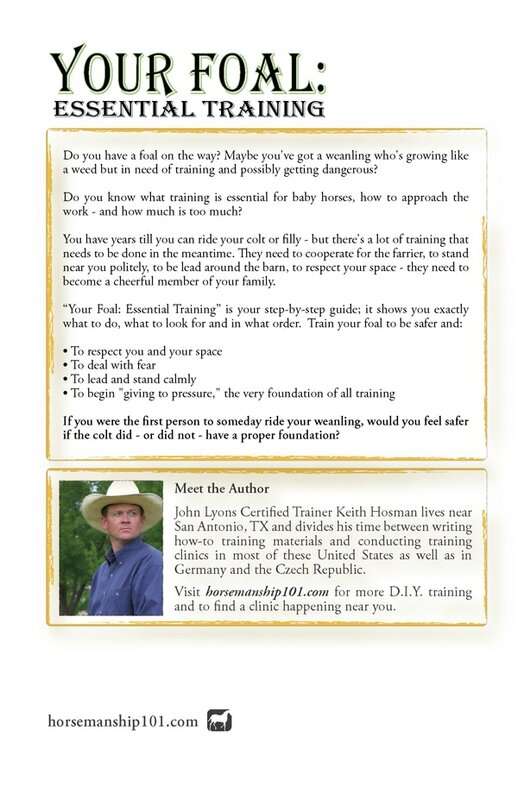 Based on the gentle and proven techniques of John Lyons, "Days" 1-5 teach your horse to respect your space, to deal with fear, to stand calmly and to begin "giving to pressure." Section II contains an additional three chapters that you might very well need at this stage in your young horse's life. I call the individual segments "days" but you'll take this work at a speed that's comfortable for both you and your foal. While you'll fly through some "days," others will necessarily require that you spend more time to really nail the material. You might want to split it up over days, weeks or months.. It's completely up to you - after all, you've got years till he's big enough to carry that saddle or pull that cart! Each chapter gives you a plan, a goal, theory and homework. The whole thing might take you a week - and it might take you months. Every trainer's different, every foal is different. Regardless, when you arrive at the other side, you will have made significant progress in your foal's training and you'll be miles ahead when it comes time later to break him to saddle.